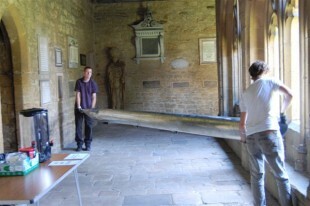 On July 1st we started to dismantle parts of the 1969 Grant Degens and Bradbeer organ at New College Oxford, for a partial restoration. The picture shows Nick Hagen and Joseph Marsden removing one of the metal Pedal front pipes for repairs and strengthening by Jacques Stinkens in the Netherlands. The pipes were beautifully made, but like a number of large pipes from that period, had started to collapse around the mouth.